Gow Lake and Calder Island. Astroblemes are the physical scars produced by the impact of asteroids or comets with the Earth’s surface. The dynamic nature of earth processes (weathering, erosion, deposition, and orogenesis) means that impact structures are rarely preserved. Five astroblemes are known in Saskatchewan. The largest, 35 km in diameter, is the deeply eroded multi-ring Carswell structure, located in northwest Saskatchewan. It has an 18 km-diameter core of Precambrian gneisses, which rebounded at the time of impact about 2 km from their original depth, just as a column of water rises up after a stone has been dropped in water. The core is surrounded by successive rings of highly disrupted and tilted sediments of the Athabasca Group; irregular bodies of impact-related breccias occur mainly in the central core. The Carswell astrobleme, created by a 0.5 to 1 km-diameter asteroid, is about 478 million years old. 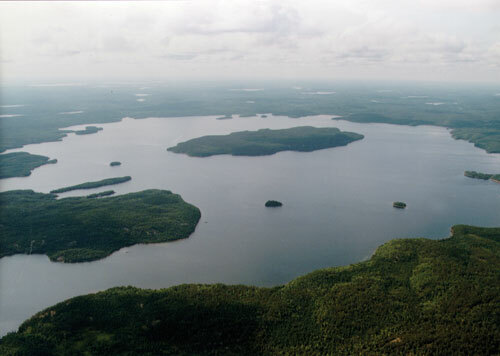 Gow Lake, about 160 km north-northeast of La Ronge, is a 5 km-diameter circular lake with a central island, Calder Island, upon which impact melt rocks and fall-back breccias are preserved. Gow Lake is one of the smallest impact structures to have a central uplift, and is about 210 million years old. Deep Bay, near the south end of Reindeer Lake, is 11 km in diameter and up to 220 m deep. Partially surrounding the bay is a ridge up to 100 m above the lake, with a maximum diameter of 13 km, which probably represents the outer rim of the crater. Deep Bay has a low, but totally submerged, central uplift. Cretaceous sediments on the bottom of Deep Bay provide an age estimate of 100 ± 50 million years. The completely buried, 2 km-diameter Viewfield Impact Structure, located east of Weyburn, was first identified by seismic surveys in the early 1970s during petroleum exploration. Subsequent drilling revealed a 100 m-deep circular feature excavated into the Mississippian bedrock and surrounded by a raised rim of breccia, the ejecta blanket, formed at the time of impact approximately 190 million years ago. The rim breccia has produced substantial quantities of oil and gas. The Maple Creek structure, discovered in the early 1990s south-southeast of Maple Creek, has a 6 km diameter and is barely recognizable at the surface. It has a central uplift of strongly disrupted Cretaceous sediments, which indicates an age of about 75 million years.